The sixth-generation Opel Corsa is based on a completely new design, which is the basis for an increase in efficiency. The Corsa will celebrate its premiere before the end of this year. Whether diesel, petrol or – for the first time – electrically powered, every new Corsa benefits from the lower weight: the driving dynamics improve, the fuel consumption falls. The lightest version of the next generation even undercuts the magical 1,000-kilogramme mark – excluding driver, the five-door will weigh only 980kg. Compared with its predecessor, this model variant is a useful 108kg lighter. This is a weight-saving of around 10 per cent, although the new model has a similar length of 4.06 metres. Reducing so much weight while retaining similar dimensions is a remarkable development achievement that directly benefits the customer. The Opel Corsa has been a trendsetter, bestseller and favourite of millions ever since its introduction in 1982. Since then, more than 13.6 million units of the Corsa have been built at the plants in Zaragoza (Spain) and Eisenach (Germany). The sixth generation is now about to go into production and will be available to order this summer. Intelligent lightweight design begins on the computer, using the newest virtual development methods. 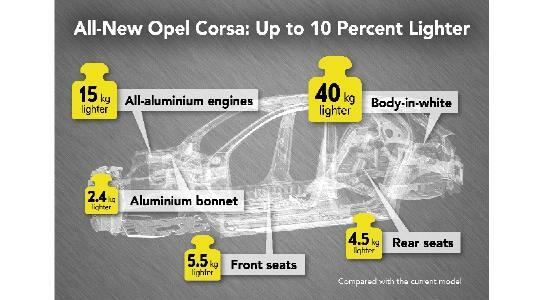 The specific use of various steel grades and connection methods enabled the Corsa’s big weight reduction. This includes the consistent use of high-strength and ultra-high-strength steels, as well as the optimization of load paths, connections, structure and form. Compared with the previous model, the body-in-white is 40kg lighter. The next Corsa is based on the multi-energy platform for small and compact cars, which allows a variety of propulsion systems. Customers can choose from combustion engines or the all-electric version. The extra-light, all-aluminium engines, together with optimization of the front and rear axles, also contribute to the low total weight. The particularly compact three-cylinder petrol engines weigh around 15kg less than the previous generation of similarly powerful four-cylinder units. Highly unusual in the small-car-sector is the new Corsa’s aluminium engine bonnet, which although longer, saves 2.4kg in comparison to the previous model’s bonnet made of steel. The Insignia flagship was previously the only model in the Opel range with an aluminium bonnet. The seats also have been put on a diet. The new optimized seat structure saves a total of 10kg – 5.5kg at the front, 4.5kg at the rear. New lighter insulating material was used for fine tuning. Altogether the measures result in a weight reduction that, in combination with optimum aerodynamics and the efficient powertrains, will lead to a considerable reduction in fuel consumption and CO2 emissions. Acceleration and braking benefit from every kg saved. 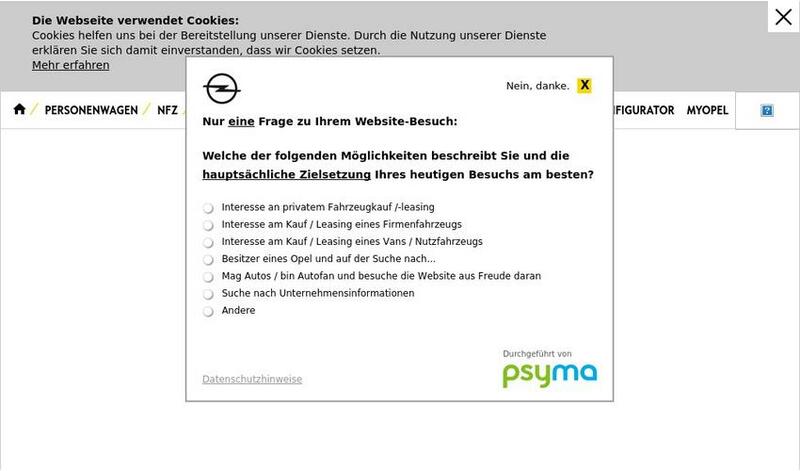 Lightweight design is therefore strategically important at Opel. The current Opel Astra, which premiered in 2015, set new standards in this respect. The 2016 “European Car Of The Year” is up to 200kg lighter than its predecessor. As a result, the agility and ride comfort of the Astra are significantly improved; throttle reaction is more responsive, the steering reacts more dynamically, the driving experience is more engaging. The weight reduction will have a similar effect on the new Corsa. The Insignia flagship followed exactly the same initiative as the Astra. 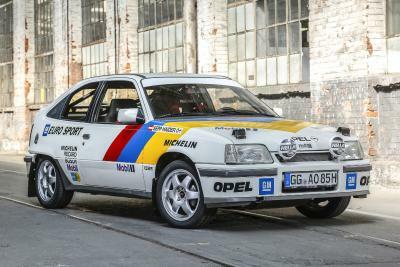 Once again the Opel engineers’ main objective was efficiency. Thanks to optimized packaging and lightweight materials they could save up to 175kg on the Insignia Grand Sport compared with its predecessor – much to the benefit of dynamics and fuel consumption. Depending on powertrain and equipment, the current Insignia Sports Tourer even weighs up to 200kg less than the similar model variant from the first generation. The Opel Grandland X is also designed for optimum efficiency and is one of the lightweights in its class. The new-generation Corsa follows the same route of consequent weight reduction – for improved driving dynamics, lower energy consumption and reduced CO2 emissions.